What I want for Christmas is (a) German Shepherd puppy that does everything that a German Shepherd does except shed and die. 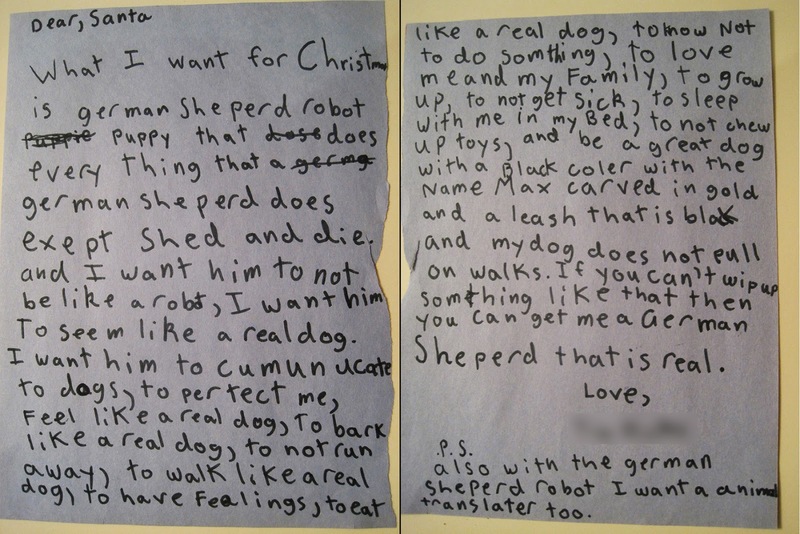 And I want him to not be like a robot, I want him to seem like a real dog. I want him to communicate with dogs, to protect me, feel like a real dog, to bark like a real dog, to not run away, to walk like a real dog, to have feelings, to eat like a real dog, to know not to do something, to love me and my family, to grow up, to not get sick, to sleep with me in my bed, to not chew up toys, and be a great dog with a black collar with the name Max carved in gold and a leash that is black and my dog does not pull on walks. If you can't whip up something like that then you can get me a German Shepherd that is real. P.S. Also with the German Shepherd robot I want an animal translator too. 1. Mr. LH is allergic to most furry creatures. If he were not, The Girl would have gotten a ferret 2 years ago and we would have something more fun than a tortoise and 2 African Dwarf Drogs. 2. Both The Girl AND The Boy have been lobbying pretty heavily for a dog lately. The Girl wants a German Shepherd (obviously, though I think she would be happy with any dog) and The Boy wants a Dachshund or a Beagle. 3. Since a dog would have to live indoors, we have already told The Girl that once we move into OUR house (not a rental), we would go to the humane society and find a dog that does not trip off Daddy's allergies (possibly a poodle or bichon - but even some labs will make my eyes water) but a German Shepherd is probably out of the question. 4. She has been told that Santa is a "feeling" rather than a "jolly old elf" (that couldn't be avoided reading the Little House books) but she still chooses to see him and the fat guy in a red suit. 5. She has been told that Santa does have limits (The Boy asked for the $400 Lego Death Star last year...not happening).